March 29, 2016 April 28, 2016 - by Gold Cochin - 2 Comments. During our time as chicken keeping enthusiasts we at the typesofchicken.com have tried many different ways and projects on this particular subject. We enjoy the eggs, the meat and the sense of accomplishment you get with the process of keeping chickens but what we love to do the most is entertain our chickens. Because much like any other domesticated animal, chickens can also show you how smart they are if you only have some patience and creativity. And this is why we at the typesofchicken.com team decided to share with you today an interactive DIY project which you can build in two ways. One way to build it is to let the chickens enjoy themselves and the other is built in that way that you will be playing with them. This project is as easy to make as it is complicated and as always we at the typesofchicken.com team want to leave room for your creativity and imagination. It works on similar principles as a normal skewer but you will need to add a few parts more so you can make your chickens work for their treat. We will not give you any specifics because we want to encourage our readers to improvise and invent new ways to keep their chickens entertained and make their lives as chicken keepers easier. Most of you are familiar how a regular skewer works – you have a thin metal pipe with meat impaled on to its middle. On both sides it is held by two other metal pipes placed high enough so that the fire that you make below will provide enough heat to just cook the meat and not burn it. One of pipes that are holding the pipe with the meat has a handle that allows you to easily rotate the pipe 360 degrees so every part of the meat will get properly cooked. Now what you need to do from the information on how a regular skewer works is you put the two metal pipes closer together and with doing this you leave more room on the side for the long metal pipe that was used to hold the meat. You connect two pieces of wooden boards of the same size and weight with the long metal pipe that was used to hold the meat. You put an equal amount of apples (remember to take the seeds out) on the top of the wooden board that is on the left side and on the bottom of the wooden board that is on the right side. At the end it should resemble a winged structure. In that way as the chickens peck, the wooden boards will rotate and the chickens will need to find a way to peck together or otherwise the apples will rotate and get away from them (make sure that the apples cannot fall of once they go from top to bottom). 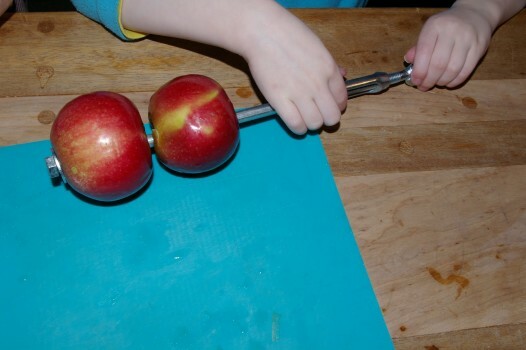 Based on the same skewer method mentioned above, you will not put two wooden boards on the side of the metal pipes but only one in the middle, you will put the apples on top(make sure that the apples are high enough so your chickens cannot reach them). So when you rotate the skewer the chickens will jump to get the treats as much as you let them. This is a great and fun way to get your chickens tired so that you will not have a lot of noise coming from the chicken coop during the night. Check out our previous articles on How To Keep Your Chickens Entertained, Part 1 and Part 2. Previous Article Pros & Cons About Keeping Faverolles Chicken! I would also like a picture or a drawing or anything visual – I can’t understand what you are trying to describe. It sound very interesting, please share something visual, or expand your description.